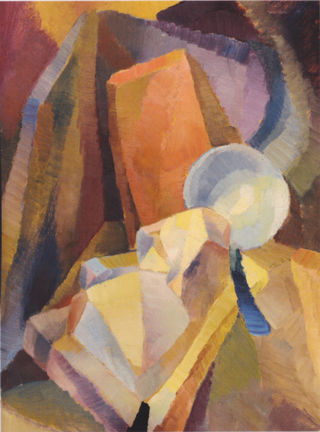 Unititled De Patta painting, circa 1917-21. Born in Tacoma and raised in San Diego in a family that struggled economically, De Patta (1903-1964) studied art in San Diego, at the School of Fine Arts in San Francisco, and at the Art Students League in New York. She went through two husbands quickly. One died of tuberculosis, her longtime friend, Martha Bielawski remembers; and De Patta divorced the other, a jazz musician. At age 25 she married a third, Sam De Patta, who sold hats at Roos Brothers clothiers in San Francisco. "Margaret De Patta was a painter," the story began. "Being a bit of a sentimentalist as well as an artist, she wanted a wedding ring that would combine a special meaning with artistry of design." What did she find when she shopped for one? The sort of stuff that, some years later, she described to the Napa Register as "junk jewelry no matter how high the price tag. It lacks the essentials of modern design and is on a par with the 'Cape Cod cottage' and the 'Alsatian chalet' in architecture—as being not of our times." So, naturally, she made her own wedding ring, learning from an Armenian jeweler on Sacramento Street. "The master taught her technique," Arts & Architecture wrote, "but wasted little sympathy over her designs." From 1929 to 1935 De Patta made jewelry as a sideline while continuing to paint. Then she went into jewelry full time, seeing in it "possibilities as a modern structural medium for creative work," she wrote. 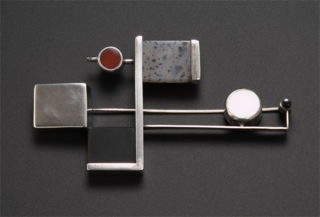 Pin (sterling silver, white gold, amber, coral, malachite, onyx, moss agate), 1950. She began working in 1939 or 1940 with the lapidary Francis Sperisen, who Richard Wise, author of Secrets of the Gem Trade, called the "father" of a new style of gem cutting. De Patta designed many of the cuts for their creations, modeling them first in Lucite. And, on her way with Sam to visit the New York World's Fair, she stopped at the School of Design in Chicago, run by former Bauhaus professor and artist Moholy-Nagy. "Talked with Moholy-Nagy and decided to take summer course," she wrote in a scrapbook of the trip. While studying at the school she met her future husband, Gene Bielawski. She divorced Sam in 1941 and married Gene in 1946. When Arts & Architecture visited in 1940, De Patta was working in the kitchen of a once "tiny ramshackle, paint-blistered cottage" in the Glen Park neighborhood that she had modernized with translucent glass walls, and a new glass-walled room on top. She did much of the work herself. The home had a terraced garden with fruit trees, "a brilliant patch of corn to out-Iowa Iowa," and herbs growing in the kitchen, where she located her jewelry workshop.